EDX1006sync as part of an synchronous ring. The device extracts the clock information and distributes it towards its clients, e.g. remote MSAN. The provider’s network is fully synchronous and the clock-information is transparently forwarded to the clients. The media conversion function of the EDX1006sync can be used to adopt the distance and fibre-mode on all interfaces. The EDXsync is a fully managed compact Gigabit-Ethernet demarcation and aggregation device for Synchronous Ethernet applications. arcutronix technology is a powerful way to enable the delivery of high quality broadband services throughout the entire CSA (carrier servicing area). The EDXsync is designed as synchronous media converter and aggregation devices in provider’s network and edge. A wide bunch of different optical interfaces are supported on LAN and WAN side of the unit. All types of SFPs are supported and so an universal synchronous converter/repeater for wavelength, fibre-mode, distance and speed can be setup. The clocking information provided on one WAN-link can be derived on the EDXsync and forwarded to all the other ports. 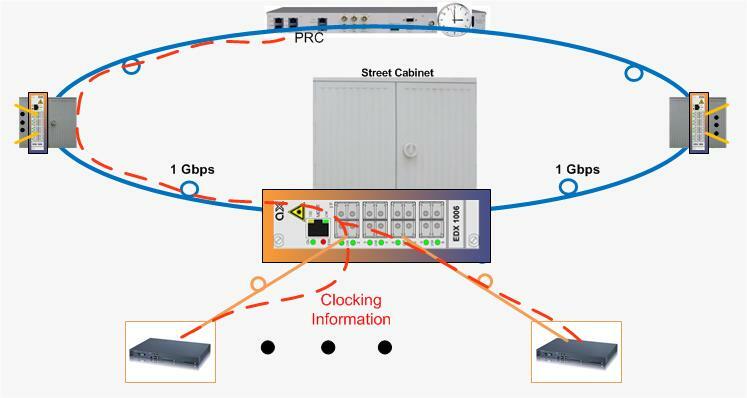 When acting on the provider’s edge the EDXsync is terminating the optical Metro Ethernet or EFM-network towards the customer’s CPE. Provider’s VLAN tagging (acc. to 802.1ad) makes it possible to transparently interconnect networks of different customers and keep full privacy of data traffic. The EDXsync offers full local and remote management access to give carrier class performance monitoring and a wide range of SLA settings via SNMP, CLI and web-based management. EDXsync can be housed in small footprint single-slot housings as well as 19’’ racks with central management access.